Over the years, there have been several interactive media projects that have inspired and occupied me. Many have involved collaborations and partnerships with others. I have assiduously maintained a daily Instagram practice involving art and walking over the last few years. 3500 posts and counting. Interactive media experiments involving interviews I’ve conducted for formal publication purposes in the last several years have made use of audio, video, images, or website references accessed from the internet, on mobile devices or sometimes in print or exhibition. A March 2014 interview and curated works with Ursula Johnson for No More Potlucks is a case in point. So is an earlier experiment I authored with Mél Hogan at NMP, exploring the chronology of ArtSpots itself. For these projects, as for several projects below, I recorded, edited and produced each of the interactive media pieces. Mél Hogan and I also co-authored an article about Google query for publication in the Society of the Query Reader #2. It was built in Google doc by exploring, sharing and analysing experiences with Google query. It’s been an interesting exercise to generate it digitally, edit and convert it to text for publication, and then rethink its presentation in a digital environment. Vicki Mayer consented to be interviewed about finding her academic voice and a publication about creativity in production that has influenced me deeply, as part of a terrific series of interviews with feminist authors at the Fembot Collective website. This latter experiment includes ongoing work with other volunteer artists and scholars, exploring ways to actively engage in the interactive media environment. For the Humanities, Arts, Science, and Technology Alliance Collaboratory (HASTAC) – a rather large international group of artists and scholars committed to working with interactive media on an ongoing basis, including in relation to the arts, I have already worked with ground-breaking interactive media scholar-artist Caitlin Fisher to produce and present an interview in that environment. 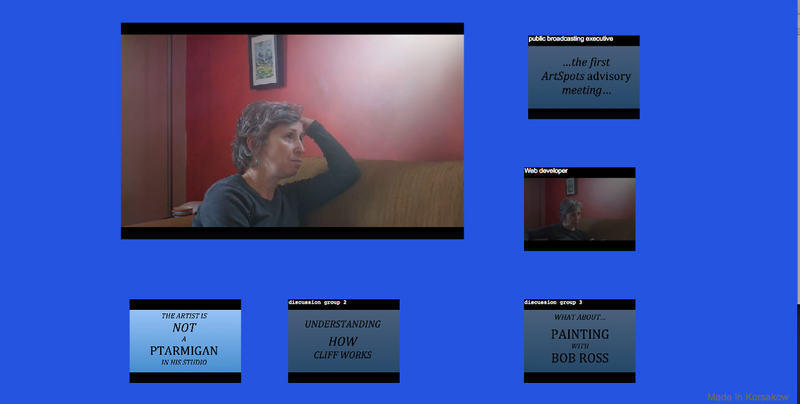 I will also be conducting an interactive media interview with one of my frequent collaborators, Mél Hogan, about her artistic work, later this spring. 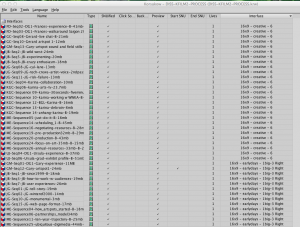 During my doctoral dissertation, I experimented with using an online software system, Korsakow, to parse new and old ArtSpots-related interviews, as well as ArtSpots programming materials from 1998-2008. One of the draft versions of these experiments can be found here. It includes 85 videos I edited and produced, sorted into five different collections, each collection relating to key themes that emerged from the analysis of the work. 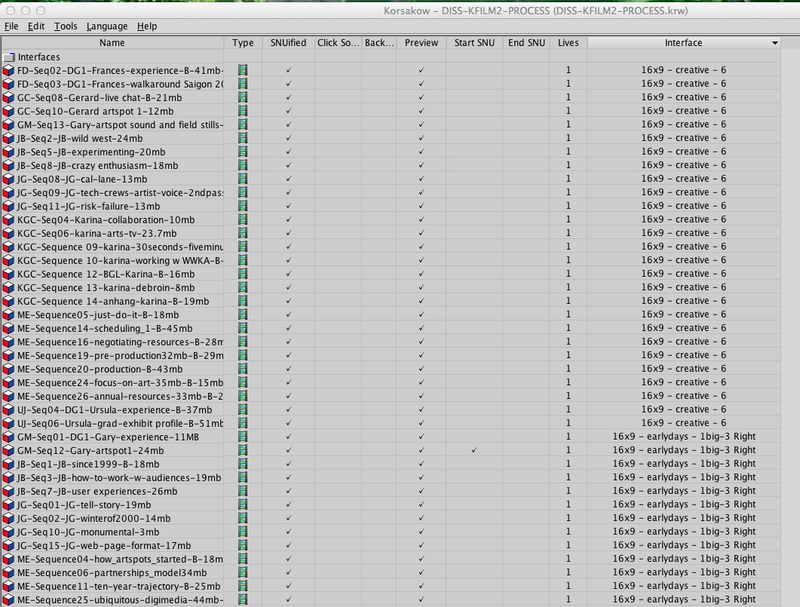 Over 300 minutes of material. You’ll notice that it’s not high resolution, since it’s a work in progress. Some of the material used is (c) the artists, or (c) CBC, as well as (c) me. In the past three years, I developed half a dozen approaches to the original video, audio, text, still images, and new interview materials. This holds promise for future reuse and remixing, for as long as CBC allows the content to be rethought and analysed in these ways. In 2009-2011, I was introduced to Korsakow when I worked with Monika Kin Gagnon, Janine Marchessault, Caitlin Fisher and Seth Feldman, Jason Rovito, and Aimée Mitchell to process a number of incredible interviews with innovative filmmakers involved with Canada’s Expo 67 experimental film exhibitions, a SSHRC-funded project. As video editor and Korsakow documentary builder, I helped the team work through some of the key findings and themes. Unfortunately, the Korsakow documentary has gone wandering into the ether, but I am hopeful that it will reappear some time soon. I also went to Newfoundland to track down the remnants of the Czech Pavilion, collecting visual images and an interview or two about how it got there in the late ’60s. Through that process, I connected with a Czech scholar who had been working on an extensive portfolio of the work of the architect involved in the pavilion. She provided me with a lot more images and material for future use. That is a project waiting to be realized once I’ve completed a few others. One of my favourite interactive media projects as a producer/director was for the 2008 Sobey Art Award Finalist Video. The Sobey Art Foundation and Art Gallery of Nova Scotia partnered to find the resources to allow me to work with the five finalists to produce a short film about their work for projection on the outside and inside walls of the Royal Ontario Museum during the Award ceremony. Later available to the artists, as far as I know it doesn’t formally exist online, so I’ve housed it here [to come]. 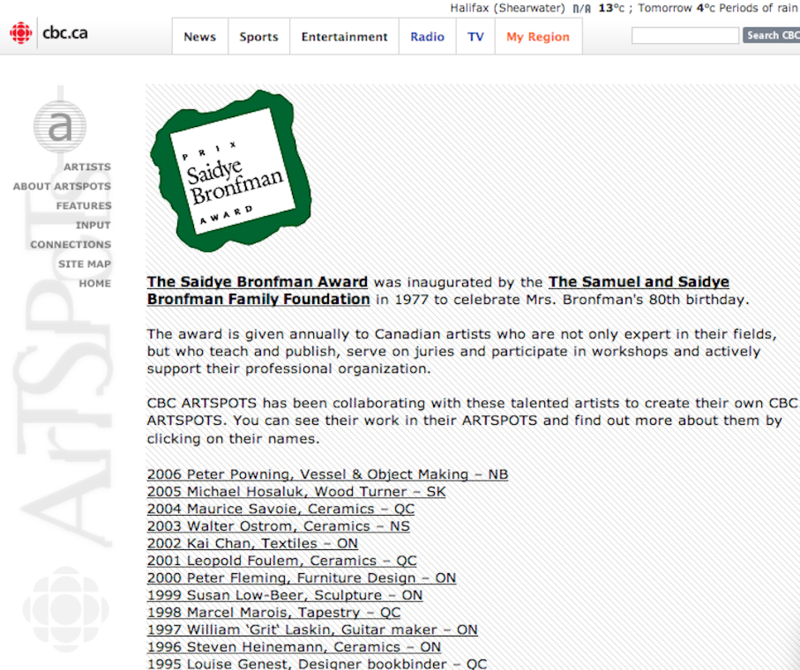 The innovative interactive media work that I’m still best-known for was as executive producer and founder of CBC ArtSpots (1997-2008), where over 1,200+ short-form videos & six long-form programs for broadcast television and internet were produced; plus 25 online features, and 2000+ artist pages on CBC.ca/artspots. Ironically, most of the videos won’t play on the website anymore but if you’d like to see them, just ask the artists (who all have copies) or me. List of awards here. 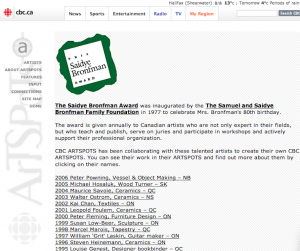 As executive producer of CBC ArtSpots, I was lead organizer and media producer on hundreds of items that were developed for multi-modal use from the partnership surrounding the Saidye Bronfman Award for Excellence in Fine Crafts, between CBC ArtSpots, the Canadian Museum of Civilization (now Canadian Museum of History), the Samuel and Saidye Bronfman Family Foundation, and the Canada Council for the Arts, Gatineau, QC and Ottawa, ON, between 2001-2007. 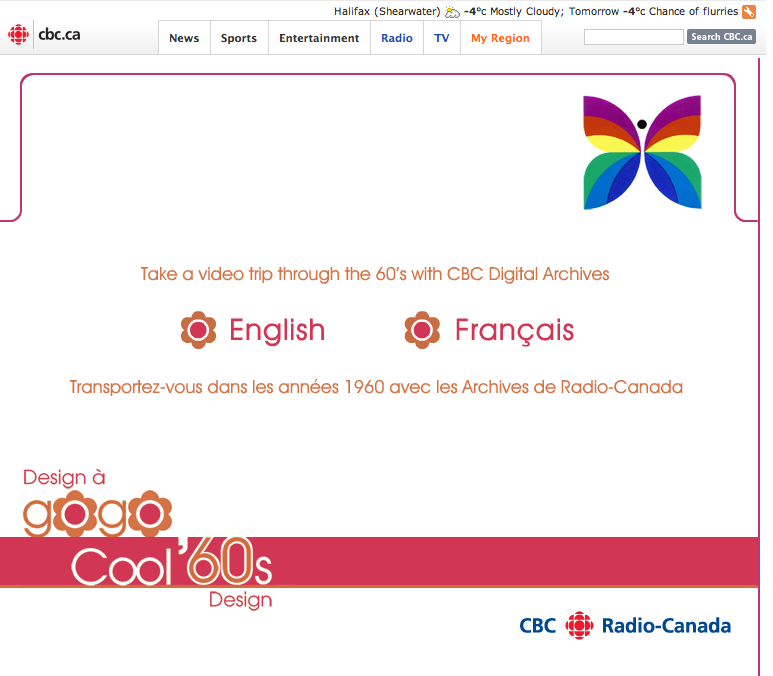 This included material developed for use in exhibitions at the Museum, as well as for television and the internet through CBC, and for use by the artists in their own exhibitions. Two long-form documentaries were produced for the internet and television, featuring 30 artists, during this relationship. Additionally, I was involved as executive producer of ArtSpots as well as partnership organizer and media producer to find archival and newer ArtSpots material for use in a terrific set of partnerships with the Museum and CBC. 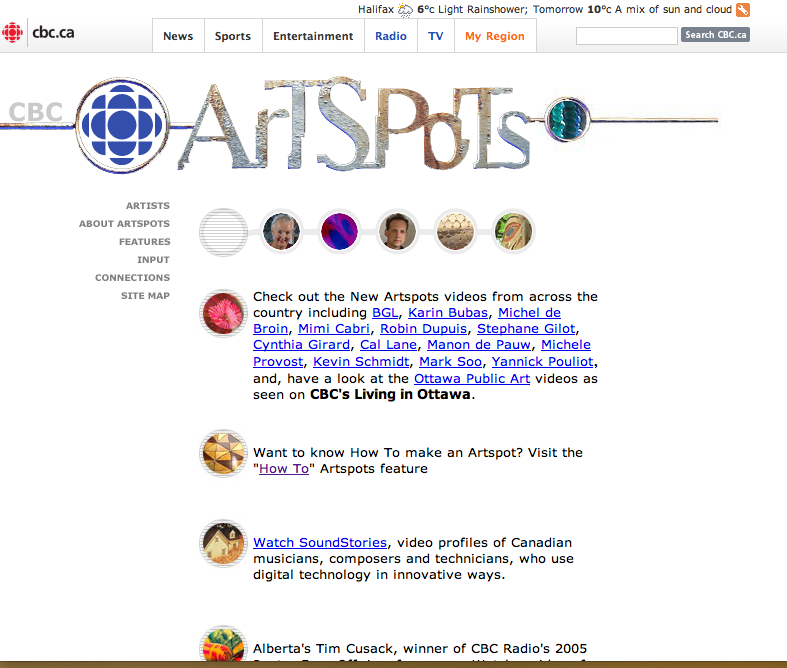 In 2006-07, CBC ArtSpots, the CBC New Media Pod and CBC Digital Archives (French and English) partnered with the Unique! exhibition at the Canadian Museum of Civilization, to produce an evergreen bilingual website and online content that would celebrate the year of craft as well as for the exhibition itself, incorporating still images, video and audio. Perhaps the most fun–and certainly the most nostalgic–interactive media collaboration with the Museum, however, was a partnership among the CBC players above with the Museum for the wildly successful Cool ‘60s Design exhibition in 2005 at the CMC/CHC. 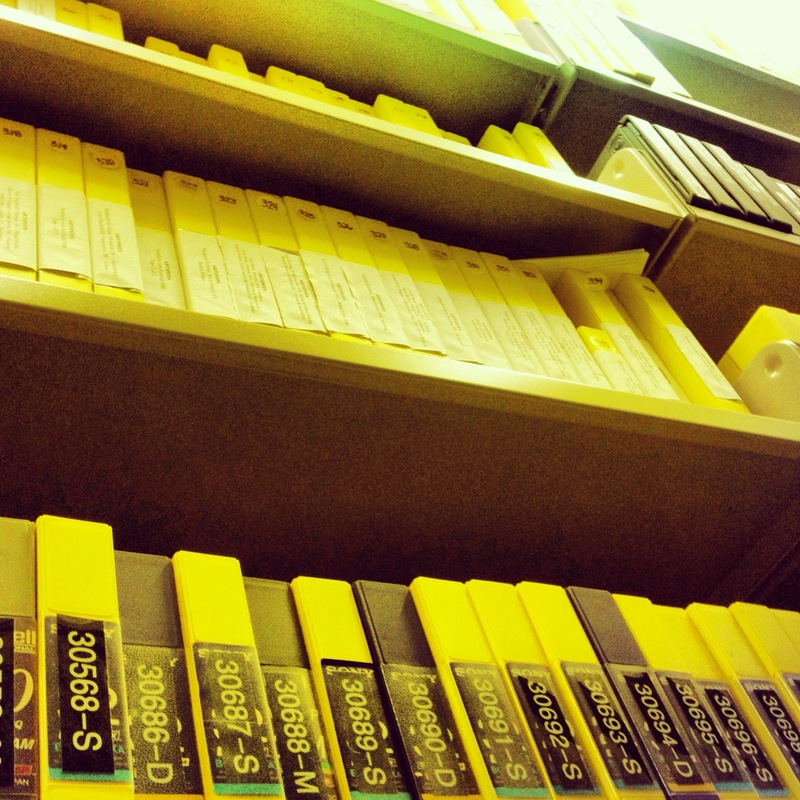 Again, video, audio and other bilingual, evergreen online content was developed. 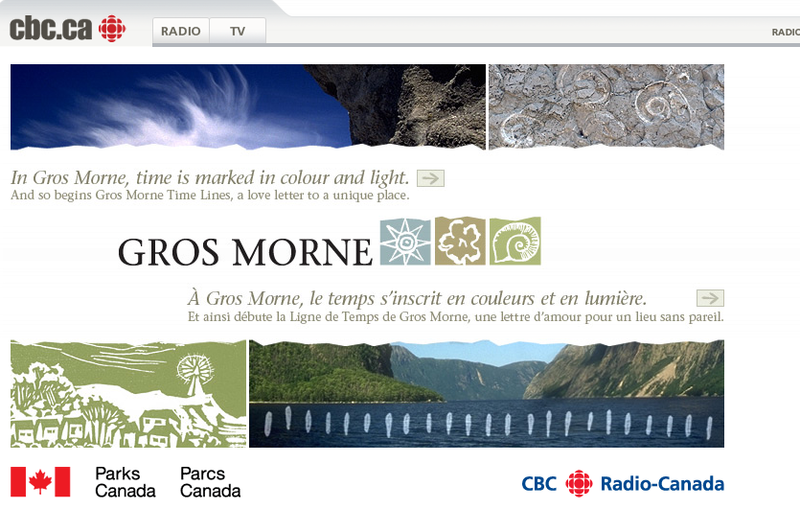 Among the most integrated and rewarding projects I have been involved in as a producer/director of interactive media was the multimedia website and documentary about Gros Morne Time Lines, an artist book celebrating the history and communities of Gros Morne National Park produced in 2004. 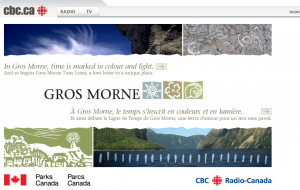 The partnership involved National Parks of Canada, the CBC New Media Pod, and CBC ArtSpots. The multimedia website produced including an animation of the artist book itself (which another artist produced), as well as the half-hour documentary I produced and directed for the website and for use onsite in the Park. The arts documentary media has seen gone on to become an integral part of the trade paperback edition of the artist book. A scholarly/media partnership was developed with two scholars at Memorial University and Simon Fraser University called Sound Stories. I was the main CBC contact on this project, and provided advice and guidance on how to conduct community involvement sessions for the identification and selection of artists, as well as having the final items uploaded to the ArtSpots website. Similarly, as a production partner for CBC ArtSpots with Oboro Gallery in 2008, I developed the partnership agreement with Oboro Gallery in Montreal to produce three interviews for use on the ArtSpots website as well as the Oboro.TV website. There were a dozen other interactive media projects with which I was involved while at CBC, including multi-modal projects such as the Halifax Explosion suite of multi-modal materials, where I produced and directed items for website and television incorporating dramatic readings or the artwork of Arthur Lismer and Garry Neill Kennedy. 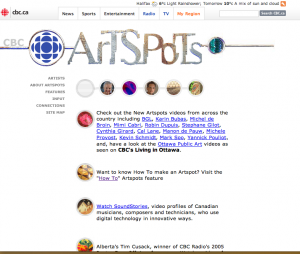 I produced or executive produced features such as “How To Make ArtSpots” (twice), digital-born Arts Canada features on artists, and the Youth Arts Site (YAS), an early prototype that influenced the development of later user-generated sites such as CBC’s ZeD. The NeoCraft conference at NSCAD University in 2007, also during Year of Craft, resulted in additional materials produced for the ArtSpots website (I executive produced these materials), as well as over an hour’s programming of media materials focused on craft artists in Canada that I curated for multiple conference locations. Appropriately, my interactive media practice began 10 years earlier as a student at NSCAD University. I produced all of the media material for two solo art installations, as well as several additional videos featured in group shows then and afterwards. Memory Site (late in 1997) was my graduation exhibition, and featured a half-hour video presented on a television in a living room setting in a large gallery, as well as several strands of vellum about 4″ high, each of which told a different angle of the story presented in the video. The other major exhibition, Small Pleasures, in mid-1997, featured multi-channel experimental videos exploring sound, skin and whispers. Several televisions and VCRs were huddled into a small gallery, surrounded by film blackout curtains, to generate an intimate space for viewing.